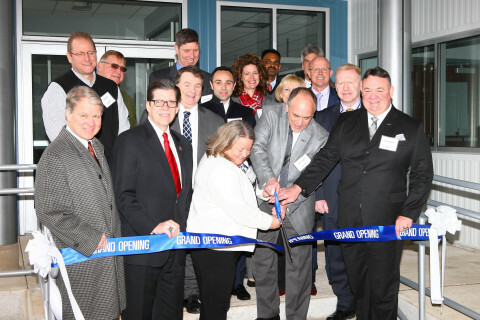 Versum Materials, Inc. (NYSE: VSM), a leading materials supplier to the semiconductor industry, announced today the grand opening of its new research and development (R&D) facility at its semiconductor materials manufacturing site in Hometown, Pennsylvania. The ribbon-cutting ceremony took place April 10, 2018. Versum employees, members of the community, local government, customers and strategic partners attended the event. The state-of-the-art R&D laboratory is dedicated to new materials used in the manufacture of semiconductors. Scientists in the facility will synthesize and purify new molecules down to parts per billion impurity levels and below using the latest technologies available in the industry. The researchers can assess the applications for these new molecules and scale up the molecules to larger quantities for customer evaluation. These new organometallic compounds will be deposited on semiconductor wafers through cutting-edge technologies to test their performance for semiconductor applications. Additionally, the facility is capable of small-volume manufacturing and advanced analytical and quality assessment. State Senator Dave Argall commended Versum for being the region’s third largest employer and for the company’s investments in the local community. Approximately 30 employees, half of which hold advanced degrees in chemistry or chemical engineering, are based in the new facility. The company’s Hometown campus now totals 250 highly-skilled employees. The latest expansion is part of a $60MM multi-year investment in the Hometown campus. Last year the company announced it had increased production capacity and modified equipment configuration to reduce manufacturing bottlenecking. Versum’s Hometown manufacturing facility produces a variety of high purity specialty gases and chemicals for semiconductor manufacturers around the world, including Tungsten Hexafluoride, WF6 and Nitrogen Trifluoride, NF3. WF6 is used as a metallization source for the formation of tungsten interconnects between multiple layers in semiconductor devices. It is an important material in the production of both logic and memory (DRAM and NAND) devices. NF3 is primarily used for chamber cleaning of chemical vapor deposition reactors. Versum Materials, Inc. (NYSE: VSM) is a leading electronic materials company providing high-purity chemicals and gases, delivery systems, services and materials expertise to meet the evolving needs of the global semiconductor and display industries. Derived from the Latin word for “toward,” the name “Versum” communicates the company’s deep commitment to helping customers move toward the future by collaborating, innovating and creating cutting-edge solutions. A global leader in technology, quality, safety and reliability, Versum Materials is one of the world’s leading suppliers of next-generation CMP slurries, ultra-thin dielectric and metal film precursors, formulated cleans and etching products, and delivery equipment that has revolutionized the semiconductor industry. Versum Materials has annual sales of approximately US $1.1 billion, 2,200 employees and 12 major facilities in Asia and North America. It is headquartered in Tempe, Arizona. Prior to its separation on Oct. 1, 2016, Versum Materials had operated for more than three decades as a division of Air Products and Chemicals, Inc. (NYSE: APD). This press release contains “forward-looking statements” within the meaning of the safe harbor provisions of the U.S. Private Securities Litigation Reform Act of 1995, Section 27A of the Securities Act of 1933 and Section 21E of the Securities Exchange Act of 1934. These forward-looking statements may be identified by references to future periods, and include statements about our intentions to continue to invest in our U.S. workforce and expand our capabilities to innovate the semiconductor industry. These forward-looking statements are based on management’s reasonable expectations and assumptions as of the date the statements were made. Actual results and the outcomes of future events may differ materially from those expressed or implied in the forward-looking statements because of a number of risks and uncertainties, including, without limitation, weakening of global or regional general economic conditions and product supply versus demand imbalances in the semiconductor industry could decrease the demand for our products and services; operational, political and legal risks of our international operations; hazards associated with specialty chemical manufacturing could disrupt our operations or the operations of our suppliers or customers; changes in government regulations in the U.S. and in other countries where we operate; raw material shortages and price increases; fluctuation of currency exchange rates; increased competition; and other risk factors described in our filings with the Securities and Exchange Commission, including in our Annual Report on Form 10-K for the fiscal year ended Sept. 30, 2017, and in our periodic filings. Versum Materials assumes no obligation to update any forward-looking statements or information in this press release. The Versum Materials logo and Versum are trademarks of Versum Materials, Inc. or its affiliates.